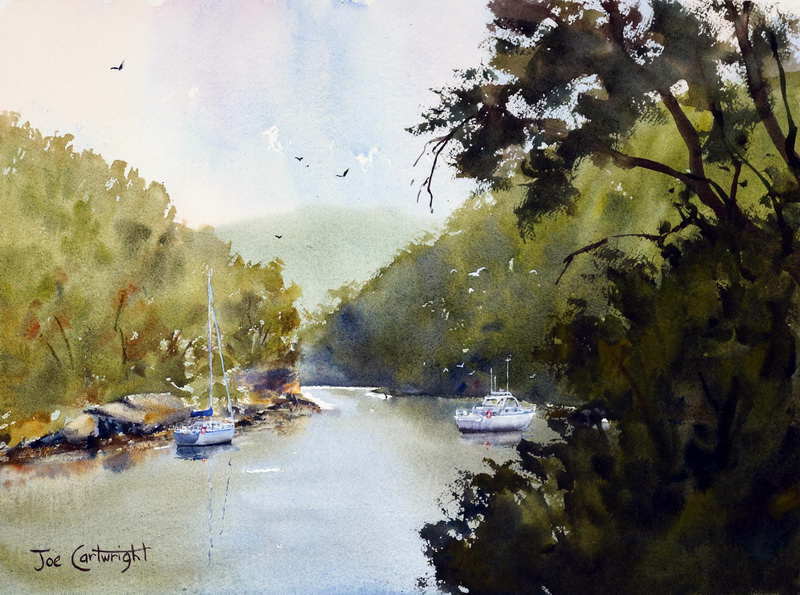 Last weekend we had a very pleasant get together with some close friends who live on Berowra Waters, New South Wales. 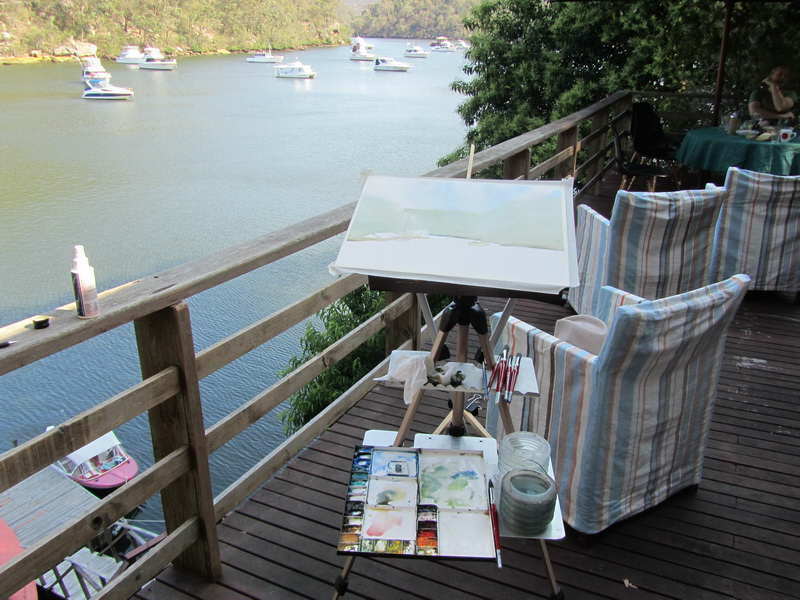 I have visited them many times and always found myself spending a lot of time looking out at the beautiful view from their deck and wanting to paint it. This time I took the opportunity to do some plein air painting and took my outdoor watercolor painting kit with me. 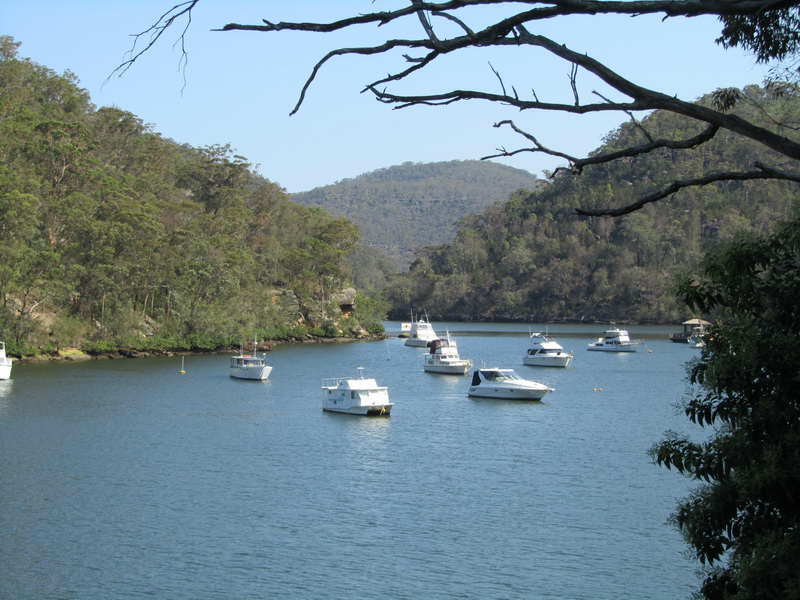 Berowra Waters is on the outskirts of Sydney less than an hour from the center of the city. There are very few houses on the water and there will never be any more due to limited space and planning restrictions. It is a wonderful location, very peaceful and beautiful and a great place for contemplation and creativity. I have put together a reasonably lightweight outdoor watercolor kit that I use for my plein air painting. It is basically constructed from and old cutlery box and a light photography tripod. At some point I will provide more details of my system as I had fun putting it together for a trip I was taking to Venice where weight was an issue. For now you can at least see a picture of my set up below. 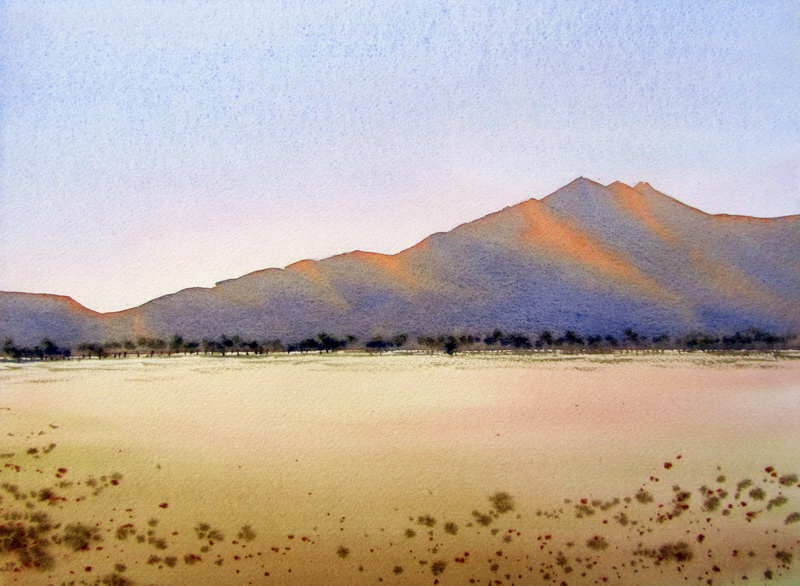 This painting was done on an Arches 300 gsm Cold Press watercolor block. I like to use a block when painting plein air as I don’t need any supporting board nor tape to keep the paper down. This all helps to keep weight down when plein air painting; this is especially important if you have to carry your gear for any length of time. However, I do sometimes tape around the edge anyway as I like to see what my painting looks like after the tape is removed – a bit like putting a mat over it. As usual the painting was done from light to dark. Starting with the sky and painting the most distant hill while the sky was still wet to give it a soft edged look. I took my watercolor paint color across all the hills and let it dry. After this dried completely I painted the stronger hills to the left and right. Again I let it dry. You must resist the urge to keep watercolor painting into damp paper or else you will end up with a muddy mess. This is particularly important with plein air painting as you are often at the mercy of the weather and your paper will often dry very slowly. You just have to be patient. It is better to finish off a watercolor painting back in your studio rather than ruin it by trying to get it done by continuing to paint in damp paper. My next step was the water at which time I dropped in the reflections of the hills. This was followed by the tree branches and foliage on the right. Finally I painted in the two boats along with their reflections. Here is my finished plein air painting. I am quite happy with it as they don’t always turn out but this one did. 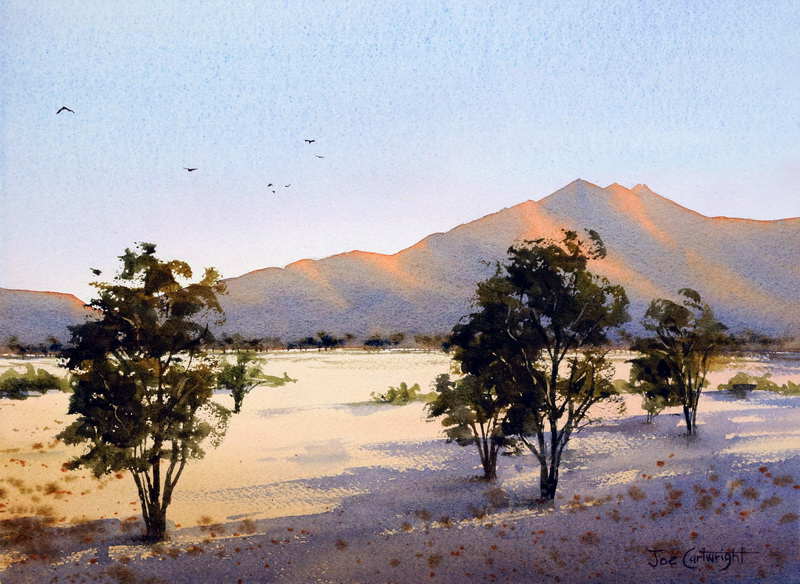 In the future I will create a full watercolor painting demonstration article of this scene and painting. For now I hope you enjoy the painting. 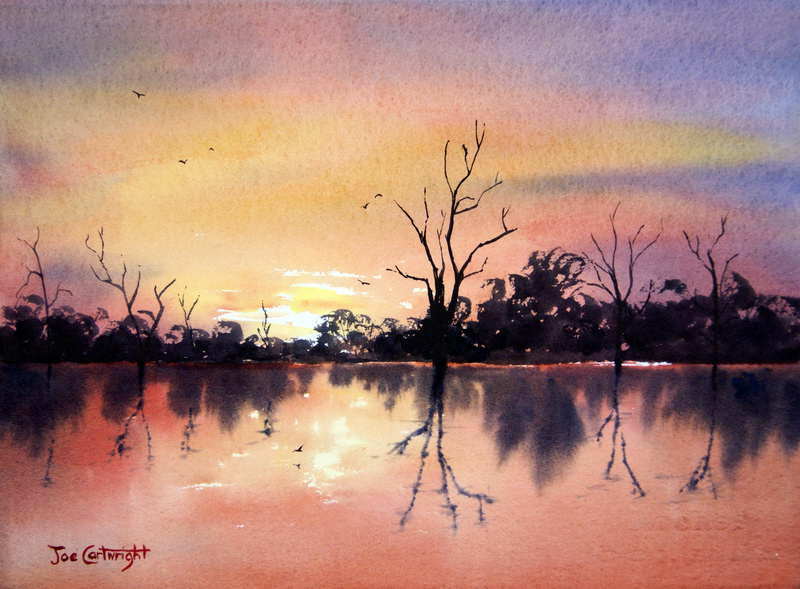 This is a class demonstration watercolor painting titled “Tea Gardens Sunrise over the Myall river, New South Wales”. 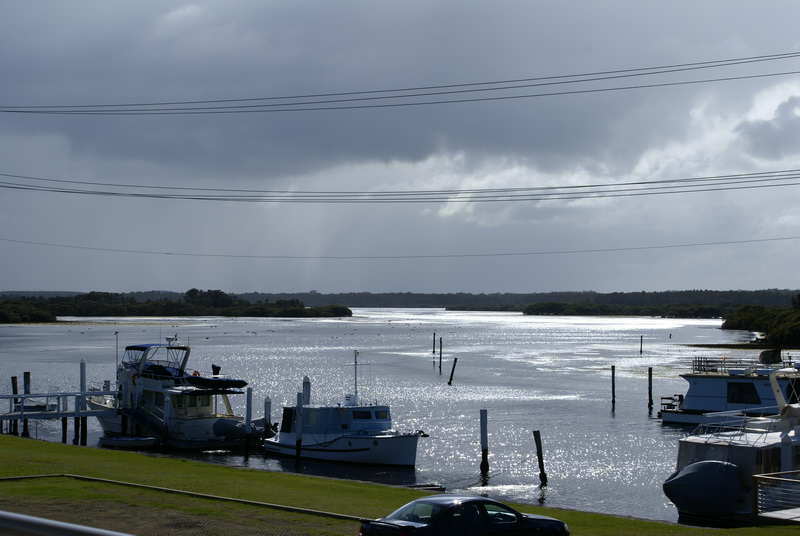 I was attracted to this scene by the light reflected on the water of the Myall River at Tea Gardens in New South Wales. Watercolor is a great medium for capturing light so decided to do this as a class painting. I simplified and made other adjustments to the photograph below to improve its composition and also to make it work better as a watercolor lesson. My key focus was to teach my students how to create a feeling of space and how to capture the early morning light reflecting off the water surface. The next step, after making my design decisions, was to do a very simple drawing of the scene on my cold press watercolor paper. 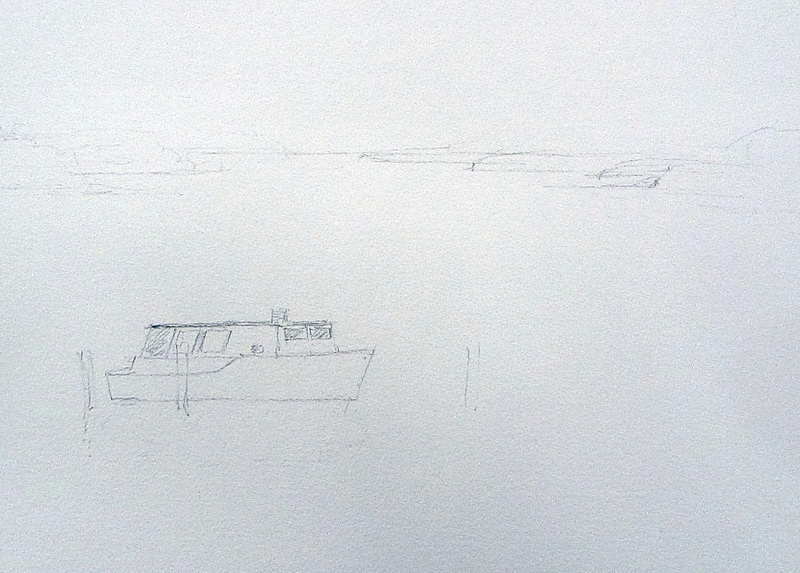 Figure 2: Drawing prior to watercolor painting. 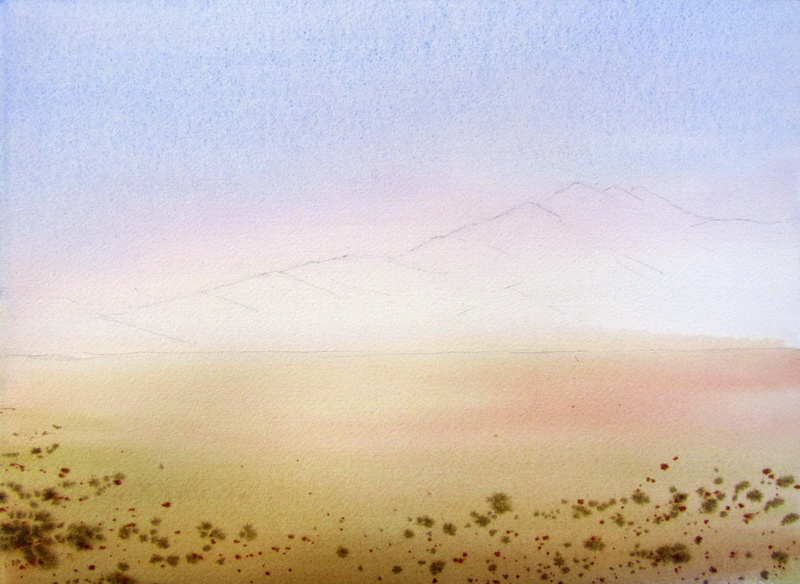 My next step was to paint the sky with my watercolor paints and while this was wet to paint the distant hills. I worked with progressively stronger tones (more pigment, less water) as I moved closer to the foreground. The land closest to the viewer was completed after the sky area had dried so I could produce hard edged shapes against the sky. Notice how the land jutting into the river is basically horizontal where it connects with the river. This stops the river area from looking like it is flowing up hill. I let this dry completely. The water in this scene is painted with the side of my round watercolor brush. I used quick movements to create a dry brush stroke which gives the impression of light on the water. The distant water is lighter (thinner mix) and bluer than the foreground which is stronger in tone (more paint) and slightly warmer – there is a little Burnt Sienna in the mixture. The sparkle on the water is just left white paper. After the water area is fully dry I painted the house boat and then its reflection. As the boat is very light colored the reflection has to be a little darker. This watercolor painting was finished with the addition of various bollards and poles in the water and a few strategically placed birds in the sky and over the river. This article is not meant to be a full demonstration but more a reference for my students to use. You should be able to understand some of my watercolor painting technique for this type of scene however. 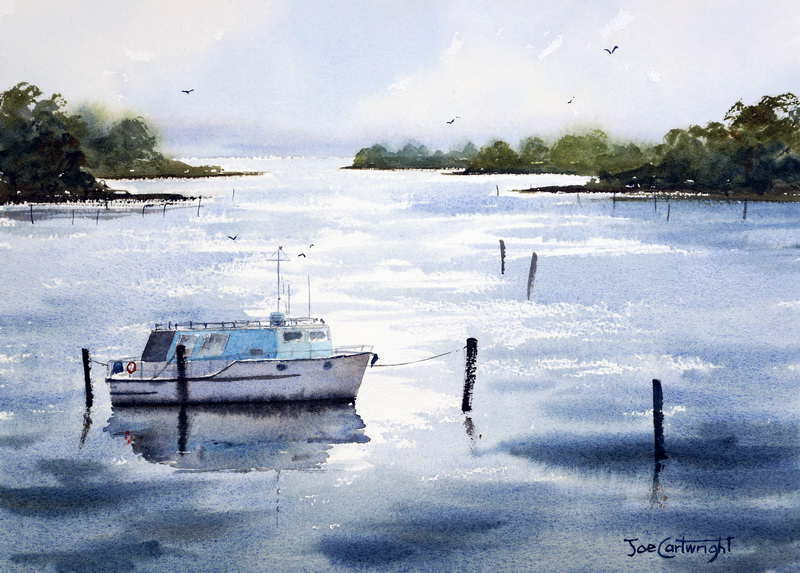 I do have a similar and more detailed demonstration here: simple watercolor painting demonstration of boats and water. 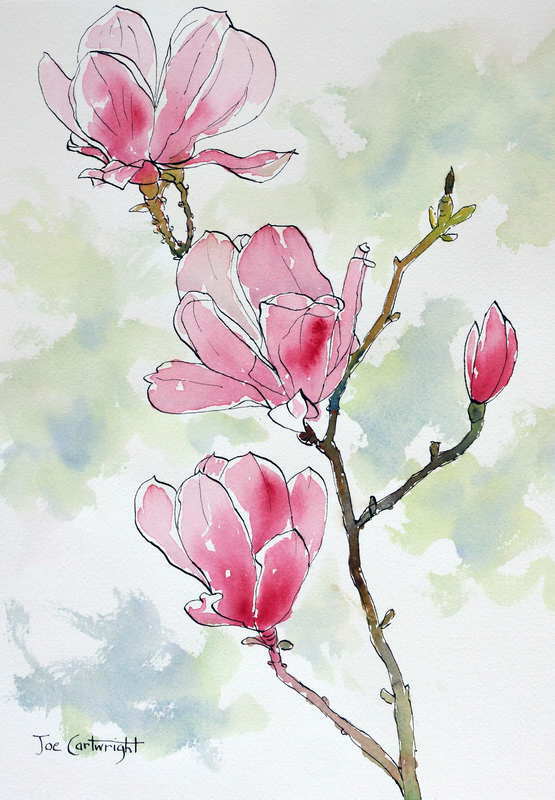 I have just posted, on my PenAndInkTechniques website, a demonstration of pen and wash drawing / painting of Pink Magnolias. The pen, ink and watercolor wash demonstration starts with the selection of a suitable reference photo. In this case the photo is of my wife’s favorite tree in our garden. I looked for an image with a nice composition (though I still had to adjust it slightly) and a strong light and dark pattern. It then covers the materials required and how to do the ink drawing which is done directly without any prior pencil sketching. Usually I find when I tell my students that they are to draw directly with the ink they get all nervous and concerned. However it usually surprises them just how well they do. By drawing directly with ink it forces students to think and observe more, before they actually touch their watercolor paper with their ink pen. I have found this improves their overall drawing skills as it helps them to develop good drawing habits. Also because the ink is permanent, it teaches them to just lay down a mark or an ink wash and just leave it. As the ink is permanent it removes the temptation to fiddle. Fiddling with the watercolor paint on your paper is a common problem for beginner watercolor artists. Pen and ink is also quite a forgiving medium as it is very hard to create a muddy look as often happens with a failed watercolor painting. After the pen outline is done I allow it to dry thoroughly. In the next to final stage in this pen and wash painting I cover how to lay a loose watercolor wash over the magnolia flowers and stems. The painting is finished with a very loose and sketchy watercolor wash for the background. 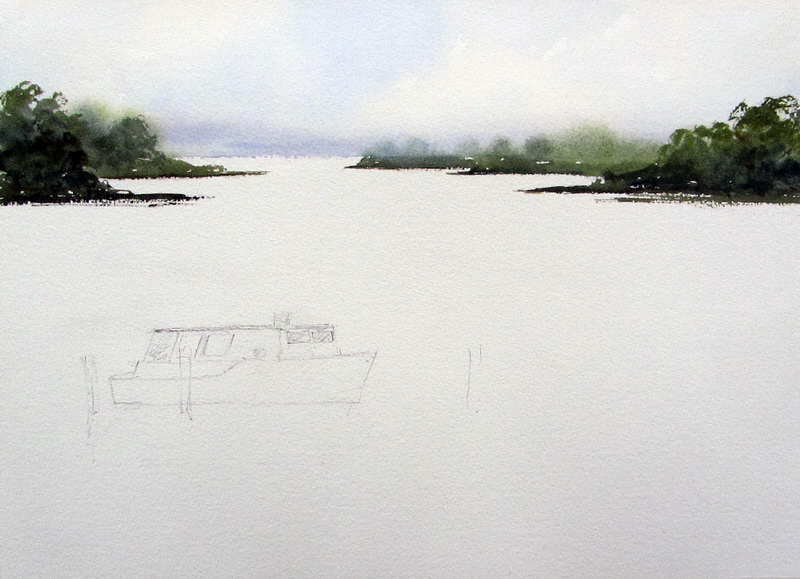 If you have an interest in pen and wash work you may like to have a look at my demonstration.